Cheerleading is a tough gig! To make your life a little easier, we’ve reviewed the 9 best cheer shoes in 2019 in this buyer’s guide. We’ll look at the best cheerleading shoes for bases, flyers and tumbling. After that, we’ll outline some key things to consider when buying, so that you can choose the right cheer shoes for your specific needs. DEFINITION: the flyer is the person lifted in the air by other cheerleaders during a performance. Their job is to do aerial stunts and captivate the audience’s attention. As a flyer, you’ll want nimble, lightweight shoes that allow you a good range of movement. As we just mentioned, flyers need super light shoes in order to perform stunts in the air. However, you’ll also want shoes with a fairly smooth outsole, so that your bases don’t hurt their fingers as they lift/catch you. The Nfinity Vengeance ticks both of these boxes. The outsole is grippy but doesn’t hurt to hold, and the entire shoe weighs in at only 3.9oz, making it one of the lightest cheer shoes on the market right now. Despite being so lightweight, this is actually a fairly durable shoe. The sole is reinforced with pylon pads to add a little bit of extra thickness, and the nylon material is very tough (but also super easy to clean). Another unique thing about this shoe is the see-through upper. The Vengeance allows you to change your look at any time by simply swapping out your socks for a different color pair. Overall, these are fantastic cheer shoes for flyers. Just note that a) they run pretty small and b) they’re fairly expensive. However, you definitely get what you pay for. See-through upper allows you to choose any color you’d like. These shoes are a little heavier than the Nfinity Vengeance we just looked at. They weigh 7.5oz each as opposed to 3.9oz. However, the Apex is still incredibly nimble. It doesn’t feel heavy at all – this shoe has the agility you need when jumping or stunting. Not only does it allow for quick and easy movement – it also has a low-profile outsole, giving you a better feel for what your bases are doing. This can help to improve the timing of your stunts, especially as you first lift off. Plus, since the upper is a little thicker, the Apex is quite durable for a flyer’s shoe. What’s more, it comes with a nice curved arch, allowing your bases to get that little extra grip, enabling them to launch you a bit higher in the air when throwing. You get specialized bubble laces to keep the shoe secure, and the Apex is also quite reasonably priced, making it perfect for both practice and competition use. The only thing we can fault this shoe for is its breathability. While it’s nimble enough for competition use, the thickness of the upper can cause heat buildup. Unlike some other flyer shoes, this option doesn’t come with ventilation holes to let heat escape. Still nimble enough for competition use. Could use more ventilation in the upper. Kaepa is one of those brands who specialize in cheerleading equipment. Although you may not have heard of them if you’re new to the sport, their shoes are great because they’re made with cheerleading in mind. Their flyer shoe is designed to help the entire team, not just the person doing stunts. Kaepa has gone for a relatively thin rubber outsole, giving the bases a better sensory perception of the flyer’s movement, allowing them to better anticipate what the top is going to do next. Also, the arch is a really nice shape to hold, meaning the bases can perform higher throws with less discomfort. The downside to this thin sole though is the lack of cushioning it provides. The upper is made of solid synthetic leather rather than mesh, meaning that this is the heaviest flyer shoe we’ve looked at so far. But since this material is fairly thick, you get better overall protection. Plus, this shoe is more durable than most other mesh options. Considering how reasonable the price is, this shoe is definitely worth trying. It’s even suitable for tumbling, as the insole is engineered to adjust to your arch height, creating a stable platform for cartwheels and flips. Just remember though that this is a fairly heavy shoe. As a result, it’s probably better for sideline performances and outdoor practice rather than competitive routines. Very durable – tough upper. Makes your bases’ lives easier, improving team performance. Not much cushioning in the sole. DEFINITION: tumbling is the process of doing physical stunts as a cheerleader like cartwheels and handstands. For tumbling, you’ll want a cheer shoe with a stable sole, to allow you to begin your stunts without sliding/slipping. You’ll need something with good grip but also a shoe that’s fairly nimble. When tumbling, your feet are going to be doing all sorts of stuff. You’ll be jumping, running, and landing, all on hard surfaces, which can put immense strain on your ankles. Having a high-top provides an extra level of support, helping to prevent injuries and giving you more confidence as you launch off the ground. Plus, the ultra-tough heel and upper is designed to offer further protection when landing, so you can tumble without fear of hurting yourself. The ankle support isn’t the only thing that makes the Titan an awesome tumbling shoe though. Nfinity has also employed a super springy footbed for rebound assistance, allowing you to launch higher in the air with each jump. Less effort is required to get off the ground, meaining you can keep tumbling for longer without getting fatigued. What’s more, you also get “bubble” laces, which almost never come undone. In addition, Nfinity has included two straps to keep your foot snug and secure, reducing your chances of developing blisters while performing. Although these are expensive shoes, they’re very durable, and the upper is treated to prevent staining, so they’re very easy to clean. For tumblers, you can’t really go past the Nfinity Titan. Springy sole helps you jump higher. Excellent heel & ankle support. Bit expensive, but they’re worth it in our opinion. Not a fan of high-tops? This shoe is a more traditional-looking option for tumbling. Kaepa’s main focus in producing the Stellarlyte was to create something that fits really snugly. This security is great for tumblers, because if your foot shifts inside your shoe as you initiate a stunt, you might lose confidence and begin to bail out, which could lead to serious injury. Another great thing about the Stellarlyte is the arch. Kaepa’s “Secure-Fit” technology adjusts to the shape of your foot as you break it in, making for a super comfortable insole. As a result, you can tumble with the confidence that the bottom of your shoe will provide a stable platform for you to begin the next move in your combo. The Stellarlyte is also reasonably priced, and the mesh is very breathable. It comes with an anti-microbial internal lining and a Scotchguard waterproof coating to keep the inside of the shoe clean, which proves to be very useful. If the upper does get dirty, it wipes down fairly easily. Just remember though that this is a competition shoe: it’s designed for indoor use only. The outsole is EVA-injected to make your landings more comfortable on hard surfaces. This shoe is also engineered to be extra flexible, which makes tumbling on spring floors/indoor mats much easier. Comfortable – breathable mesh upper. This cheer shoe is pretty similar to the Nfinity Titan we looked at earlier, except it’s not a high-top. You get a super springy outsole for higher jumps, plus an insole that molds to the shape of your foot for easier landings. This is also a really snug-fitting shoe – “AnkleLoc” technology helps to keep your ankle in place even when tumbling, preventing painful rubbing between your heel and the inside of your shoe. However, the overall ankle support isn’t quite as good as what the Titan offers. Another great thing about this shoe is how light it is, weighing in at only 6.5oz. This makes it much easier to get airborne, allowing you to perform more spectacular flips and twists with less effort. The outsole is super flexible, and it comes with rubber pods designed to prevent wear in high-impact areas, like the toe. For the most part they do a good job, but the rest of the shoe isn’t incredibly durable, due to the lightweight mesh used in the upper. Expect to have to replace them every season at least, especially if using these shoes outdoors. Despite being an excellent overall shoe for tumbling, the Evolution is pretty expensive. You do get bang for your buck, but there are definitely more economical options out there. Bouncy outsole – easy to get airborne. DEFINITION: a base is a cheerleader who supports the flyer as they perform stunts in the air. To succeed in this role you must be a strong athlete with superb coordination and excellent communication. Bases need shoes with good traction to avoid slipping during stunts. Your shoes must also be able to support your ankle when lifting the flyer. For bases, having shoes with excellent support is key. As you lift the flyer, you want your feet to be stable and secure, to avoid slipping over or injuring yourself. This is why Nike’s Sideline III cheer shoe is perfect for bases. The arch and heel support is tremendous, in large part because the upper and outsole are made of tough synthetics. Although there’s a fair bit of mesh (which makes these shoes extra breathable), this shoe isn’t super-duper light – it weighs in at 9.7oz. However, this isn’t an issue for bases, since you’ll be spending most of your time on the ground rather than in the air. There’s another hidden benefit to having a slightly heavier shoe – the extra durability this offers. The Sideline III is sure to last a season or even more, depending on how often you use them. They’re fit for outdoor practice and sideline routines, making them a versatile option for nearly any cheerleader. However, you might want something more nimble for competitive events. Something the Sideline III offers that most other shoes don’t is the ability to customize their color. Although the main shoe is white, Nike includes a number of colored inserts which you can slide into the upper. This allows you to modify your shoes to match your outfit or school’s jersey. Awesome support, both for the arch and ankle. Not incredibly light (but not too heavy either). This is a shoe with a nice thick outsole and plenty of padding, making it incredibly durable but also nice and cushioned. What’s more, this shoe has a relatively tall profile, meaning it offers excellent all-around support, especially in the heel area. While Dadawen’s shoe may look similar to your everyday trainers, it’s still a cheer shoe at heart. The outsole is designed to avoid leaving marks on polished surfaces while still offering excellent grip – exactly what you need as a base. It even does a good job outdoors, making it perfect for sideline routines. Plus, you get an anti-microbial lining to prevent odor buildup, and there are ventilation holes in the upper for breathability. This design helps to keep your feet a little cooler, even when cheering outdoors in super-humid conditions. These shoes are quite tough considering what they cost. Dadawen even advertise that they’re suitable for everyday uses, like jogging, or trips to the mall. However, we’d recommend just using these shoes for cheerleading if you want to prolong their usable lifespan. None to mention – awesome shoes for bases. This is one of the cheapest cheer shoes on the market right now. So what’s the downside to paying a little bit less? For starters, the Cheerful isn’t incredibly durable. Although the outer is made of a pretty tough synthetic material, the seams can fall apart before the season is over if you perform more than once or twice a week. In addition, these shoes are fairly heavy, but this isn’t such a big deal for bases and spotters. On the plus side, you get 20 interchangeable snap-on colors, allowing you to customize the shoes to match your uniform. These shoes are also fairly comfortable to wear, because the internal mesh is nice and soft. Plus, since the upper is so tough, the Cheerful offers excellent heel support and awesome overall stability. They certainly get the job done when lifting and supporting your flyer. Ultimately, if you’re new to cheerleading, these shoes are a good pick. They’re cheap, comfortable, and you can customize their color. However, there are more durable options out there. Comes with tons of colored snap-ons. Can begin to fall apart after a few months of intensive use. In this part, we’ll show you everything you need to know when choosing a pair of shoes for cheerleading. What makes a good cheer shoe? Be all-white, to avoid them clashing with your outfit. Some will allow you to customize the color using inserts you can add or remove at any time. Have a good amount of grip. Be fairly durable, but also fairly light. Generally, the lighter you go the less durable the shoe will be. It might be a good idea to use heavier shoes for practice and lighter shoes for competition. This allows you to perform at your best but still do intensive training without having to replace your shoes every month. Have the flexibility to allow your ankle and foot their full range of motion. This is essential for acrobatic stunts. If you’re a flyer, look out for shoes with finger grooves or a rounded outsole. This makes it easier for the bases to hold you up. Bases need heavier shoes with excellent traction. If you get slippery shoes, you’ll end up sliding back when holding up the flyer. For tumbling, look for lightweight shoes that also have good grip and a springy outsole. This allows you to be more nimble in performing stunts like cartwheels. Why not just wear sneakers? They (typically) have finger grips, which makes the bases’ job much easier. They’re incredibly light, allowing you to jump higher and tumble effortlessly. They’re much easier to clean, ensuring you look your best at all times. They come with a decent amount of padding to protect against impacts. The outsoles are made of rubber, which has a good amount of grip. However, normally the underside of the shoe is relatively smooth, ensuring that the bases can lift the flyer without discomfort. They (typically) have lace-locking systems or bubble laces, to ensure that they don’t come untied mid-performance. Sideline/practice shoes, which are heavier but more durable. Competition shoes, which are ultra-lightweight. They allow you to perform difficult stunts much more easily, but are less durable. Is it worth having two pairs of shoes? If you’re serious about cheerleading, yes it is. Training with competition shoes may actually cost you more money in the long run, because they will wear out quickly. And if you compete in sideline shoes, you may struggle to perform to the best of your ability. What are the best cheer shoe brands? When looking for cheer shoes, keep an eye out for traditional sneaker brands like Nike, Adidas and ASICs. All of these companies make solid shoes for cheerleaders. However, there are also smaller companies out there that specialize in cheer shoes. Nfinity and Kaepa are two examples of such brands. They also make fantastic cheerleading shoes, particularly for competitive performances. Why do some cheerleaders use boots rather than shoes? The knee-high boots you see NFL cheerleaders wearing have a more formal look to them. They aren’t really suitable for aerial routines, so they’re mostly used for sideline performances (particularly at football games). Proper cheer shoes offer much more flexibility, which is why they’re used in competitions. They’re also more comfortable, so younger cheerleaders prefer to use them as well. Cheerleader shoes are available in the same sizes as regular shoes, but there are generally only womens’ sizes available – not mens’. When ording online, be sure to look at the right size chart (a quick Google search should help you find it) to ensure that you pick the right size. If there isn’t one available, you should probably order a half/full size higher than your regular shoe size, because most cheerleading shoes run small. Remember, cheer shoes must be worn very snug. Having shoes that are too big can lead to blisters and even serious injuries when tumbling/flying. If you perform outdoors at football/soccer matches, you’ll want shoes with a little more traction (especially if you’re a base). You’ll also want shoes that are really easy to clean due to the mud/grass marks that can get on them. It’s also a good idea to go for a tough, durable shoe. On the other hand, you can use cheer shoes with a much smoother outsole if you perform indoors (at basketball matches, for example). Look for shoes that won’t leave skid marks on polished surfaces, and try to find something with a durable toe area. 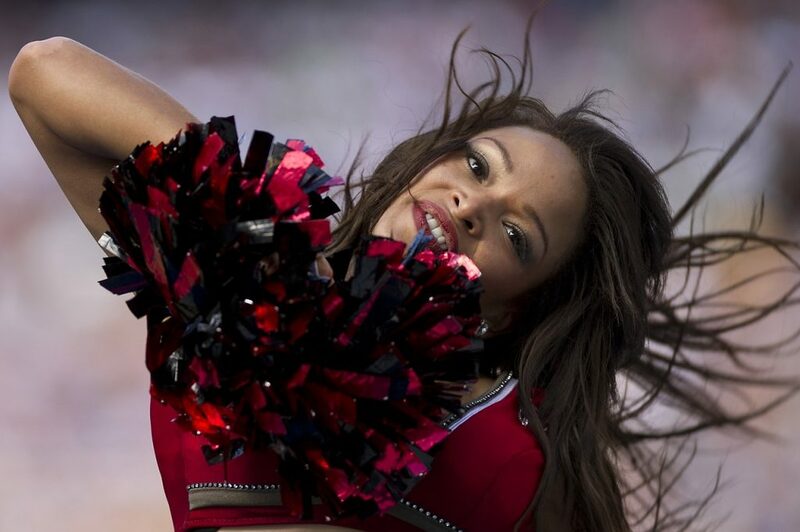 Indoor cheerleaders tend to drag their toes on the ground a lot, which can wear holes in the front of the shoe if the outsole isn’t very tough. Are expensive cheer shoes worth the extra cost? For the most part, yes they are. If you pay a little more, you’re likely to get more comfortable, ultra-durable shoes with excellent flexibility. Cheaper options may begin to show wear and tear more quickly and might prove difficult to clean. When buying cheerleading shoes for competitive performances, getting a good quality shoe is especially important. Having clunky/heavy shoes might hinder your ability to perform certain stunts, so it’s worth shelling out for somehting that’s light and flexible. We hope you found the right cheerleading shoes for your specific needs. If you’re still not sure what to go for, leave a comment below and we’ll respond ASAP.